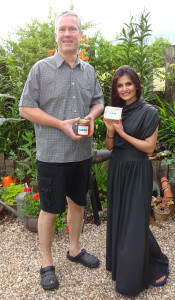 Just had a honey buying visit from the delightful Japjit Kaur and her mum. Wishing her well for her forthcoming shows touring Nirbhaya and hoping that the honey works its magic to help keep her singing voice strong. Follow this link to see the full range of my honey. On a wet Sunday I thought it time to fit the new mats I bought about a year ago for Mildred, our Austin Seven, but hadn’t yet got around to doing anything with. It all went very (surprisingly) easily. 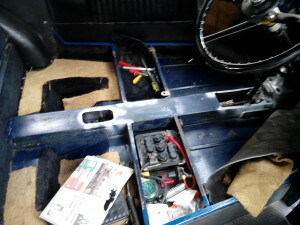 Picture 1 shows the ‘before’ . The seats are still in and the old scruffy carpet is over the centre tunnel. 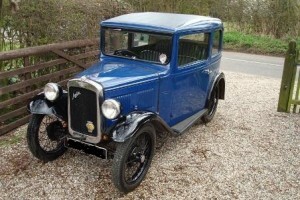 The second picture shows the stripped out mid-point. Seats, mats and carpets are out. I also took the opportunity to tidy up and rust proof some areas, which you can see by the zinc oxide ‘silver’ paint. 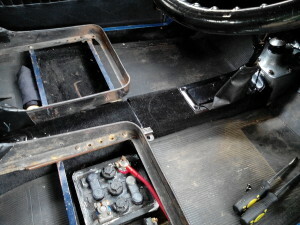 Picture 3 shows it all back together, with the new tunnel cover in place and the replica original style foot mats all back in. 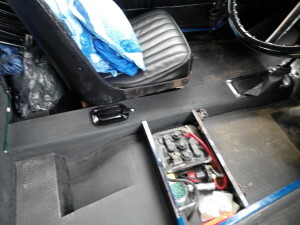 Just the driver’s seat to go back in and it is finished. All in all I am very pleased with a few hours work. I was asked a question yesterday regarding wrought iron and its ease of ‘fire welding’. Fire welding is a technique only really of interest to blacksmiths who like to work with traditional methods, rather than cheating with an arc welder. However, the modern use of the term wrought iron is worthy of a post in itself. 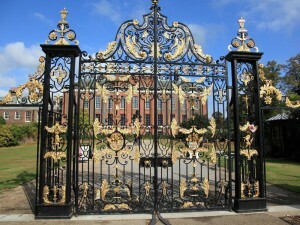 What are sold today as ‘wrought iron gates’ are in reality nothing of the sort. They are ‘mild steel gates’. It is simple misrepresentation. Would you be happy to order a mahogany table to find that a pine table arrived? Well, in my mind the same applies to mild steel being sold as wrought iron. I’ll explain. Wrought iron is a specific type of steel/iron, with a low carbon content and a high ‘contaminates’ content. A specific feature of this material is that is is relatively soft and can be formed into intricate shapes. It became the material of choice for gates and ornate structures through to the early part of the 1900s. As steel manufacturing processes developed, the demand for wrought iron dropped to the point where it was no longer financially viable to manufacture. What exists on the planet today is all there will ever be. If you want to see wrought iron today then you will find it either in 100+ year old gates hanging from ornate entrance ways, or perhaps in Victorian railings in Chelsea. What isn’t in use is in the guarded stores of a few blacksmiths who have work to restore old gates and use the material sparingly to patch in rusted sections. If you do have an old rusting wrought iron gate at the end of the garden (and that’s where blacksmiths find their stocks) then it is worth a lot as recyclable material. Don’t let it rust away. Today however, any old gate with a bit of twisted metal in it is described as being ‘wrought iron’. Describing it as a ‘wrought iron gate’, rather than the reality of ‘mild steel gate’ is a simple marketing ploy to suggest high quality. Marketing huh, or as I say, misrepresentation. That’s my blacksmithing rant over. I’ll save an explanation of fire welding for another day. Oh and as to the mis-use of the term blacksmith, that’s for another day. 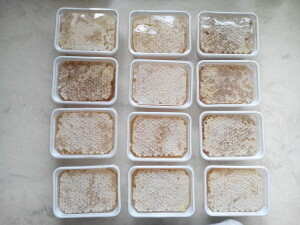 Today we took off the first frames from our garden hives to make comb honey. 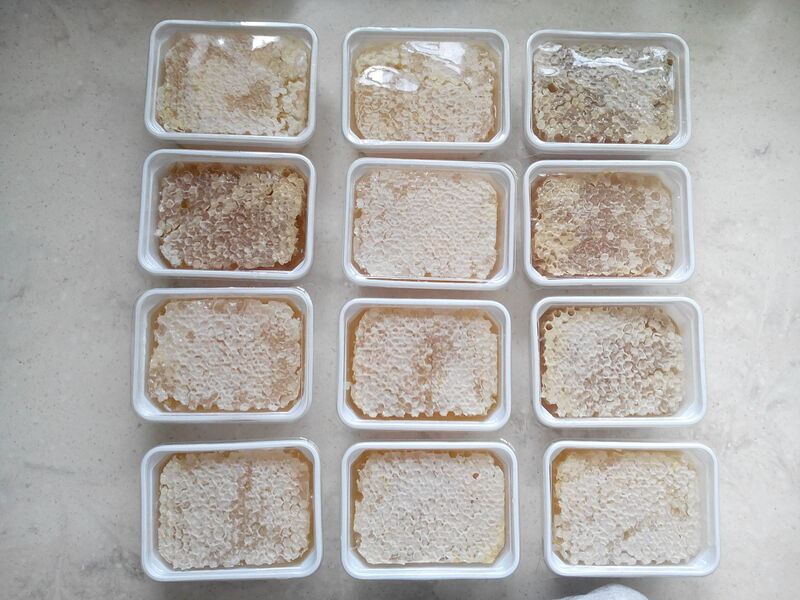 Most people understand that honey direct from a beekeeper is more likely to be ‘raw’, ‘unfiltered’ or just ‘not messed around with’ and so better for you and, many believe, helpful against hayfever. 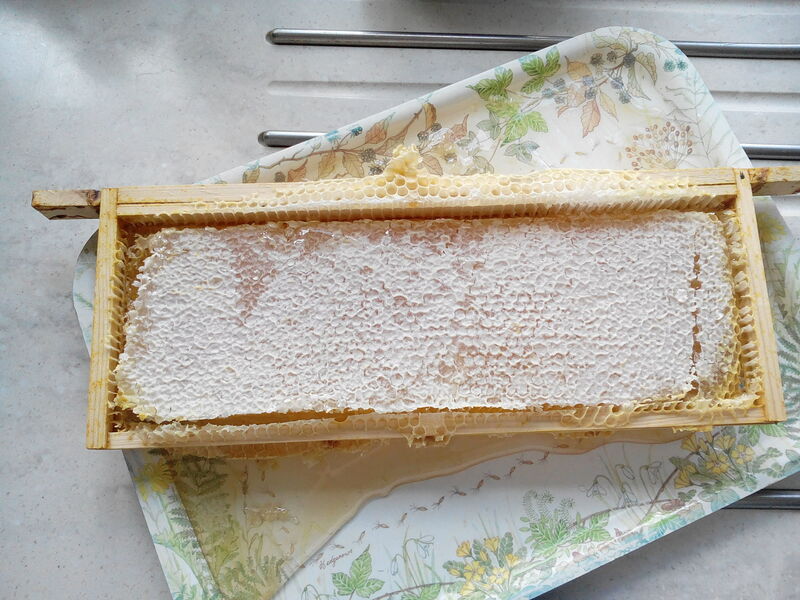 We are also often asked about the purest way to eat honey. Well, comb honey has to be it. As you can see from the pictures here, the process is simple and involves nothing more than a cutter and a tray. The frames are first taken from the supers, the shallow boxes put on top of the hive for the bees to store honey in. 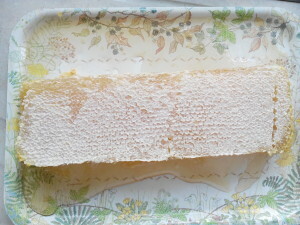 Next the wax and honey are cut from the frame as a block. Then a cutter made to the size of the container is used to cut out the right shape from the block. This section is then dropped into a plastic tray and the lid put on. That’s it, nothing else, it is ready for sale. As you can see, this means that the honey within the cells has never been touched by human hands or processed in any way. It has to be the most natural way to take honey. The first of these containers took about 20 minutes to go from hive to being on sale. If you want my opinion as to the best way to enjoy comb honey, remembering that you can eat it all, wax included, then keep it simple. 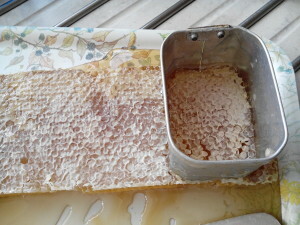 Cut a slice of the wax/honey and spread over a hot buttered crumpet or piece of toast. Nothing better. If you would like to try it then you can buy it from my sales page here. I have been watching the news about the New Horizons probe with anticipation. 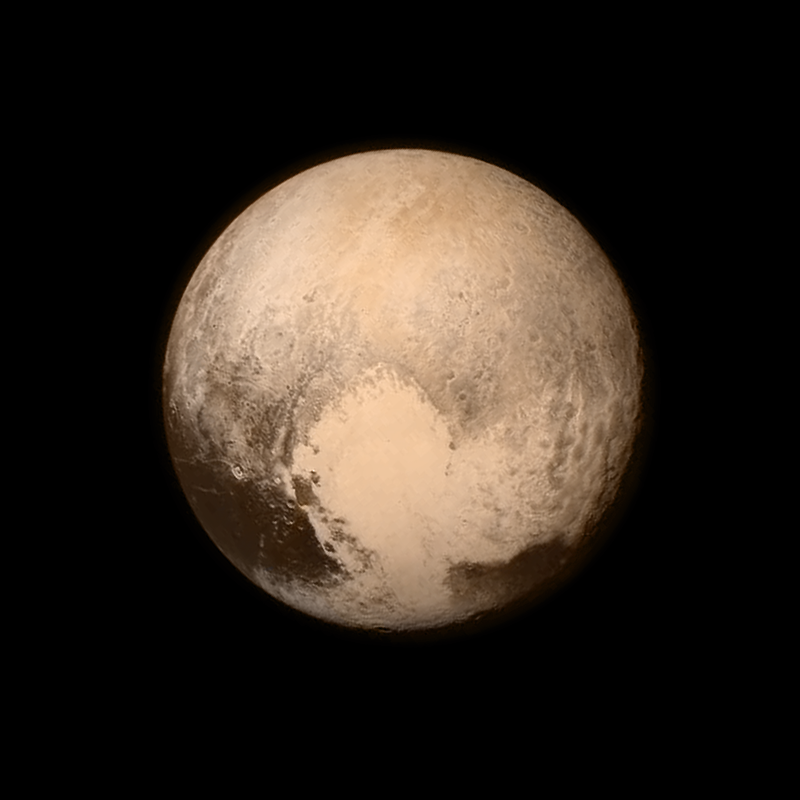 The company I used to work for, e2v, made the imaging sensors that are sending back the most detailed pictures ever seen of Pluto. They left planet Earth nearly 10 years ago. It is likely that New Horizons will take about 4 years before reaching the next object in the Kuiper belt. After this it will head onwards into space, where it may take thousands of years before it reaches anything of significance. This brings to a completion the initial ‘close’ exploration of our solar system. It also makes you appreciate how small we are and how little we know. Our solar system is 1 sun in perhaps about 4-500 billion in the Milky Way galaxy. Then there are something like 170 billion galaxies in the known Universe. That’s a septillion stars like ours in the Universe as we know it. It doesn’t begin to consider what might be out there in the Universe where the light still hasn’t reached us. It is all good food for thought for my Space Imaging talks.